I was born and raised in NC and went to college in Nashville so I am partial to red clay. 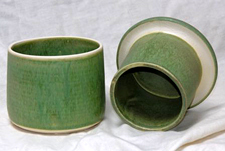 I use red clay for my garden/greenhouse pots and a smooth white clay body for my functional and decorative ware. My husband Hank and I own Freshwater Valley Stables and the inspiration for my SPIRIT HORSES came literally from the view out my studio door. There I see horses frolicking or grazing in the stable runs. 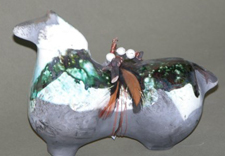 My clay horse is unique in the firing process, either pit-fired or raku-glazed. After I wash the ashes off, I then adorn each horse with copper wire, madrone, hand-made beads and feathers. The horses, when finished, represent the five elements of life --water, fire, earth, plant and air. My horses were featured in THE TERRITORY AHEAD catalog in 2003 and are in the collections of Martha Stewart, Gov. Arnold Swartzenegger and Maria Shriver, Barry Humphries and President and Mrs. George W. Bush, among others. My most recent addition is that of a chicken form hand-thrown and hand- built before glazing and firing. This was another inspiration from my menagerie of critters. My chickens often come up to the studio while I am throwing and demand, yes demand, I stop and give them some treats. All of my hens and roosters have names and I think I have about sixty all toll, although it is hard to get them all together for a group photo and therefore an accurate count. 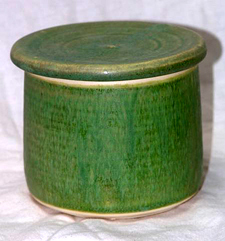 This little jar will hold one stick of butter and keep it fresh and spreadable. Plates (10”), goblets (ceramic bottom/glass top/safe in top rack of dishwasher), mixing bowls, fish platters, butterkeepers, honey pots, jam jars, square platters, leaf platters, more! Since 2003 I have been designing Christmas Ornaments for Hospice of Humboldt as their “Light Up a Life” fundraiser. Each Christmas I produce a selection of clay ornaments made using cookie cutter designs which I have decorated in various ways. Prices vary from $3.00 - $5.00.